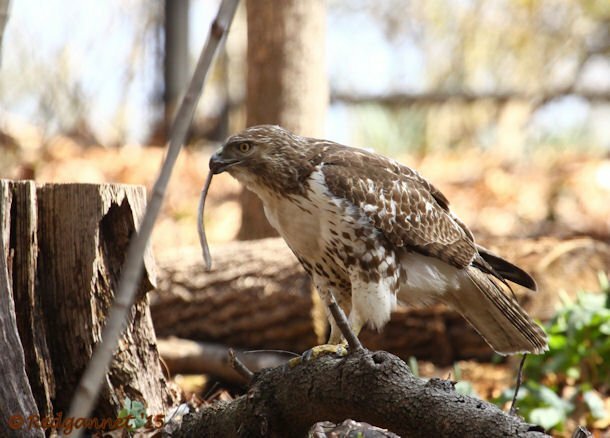 I was scanning through a few photographs that I captured recently during a visit to Woodlands Garden near Atlanta and was shocked to find one of a young Red-tailed Hawk with a cigarette in its beak. Does anyone else see James Dean? My own teenage son is testing his boundaries and I had hoped to escape the stress of rebellion for the afternoon. 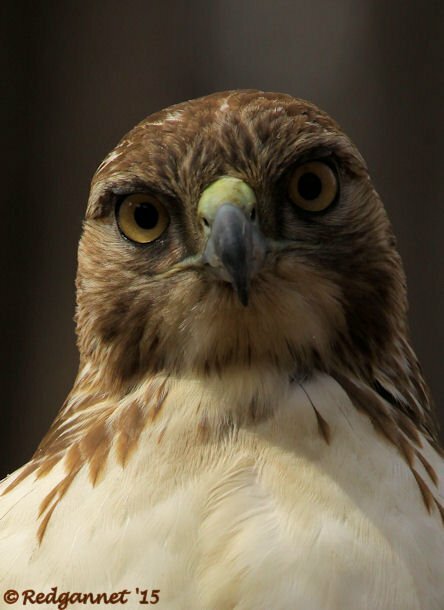 I hadn’t expected to be boldly stared down by a smoking juvenile hawk. Given the chance, I would gladly take the opportunity to berate the world in general for littering and for carelessly discarding cigarettes, but I must come clean and tell you the whole story. The bird had flown passed me a few moments before and I had found it again further along the trail. 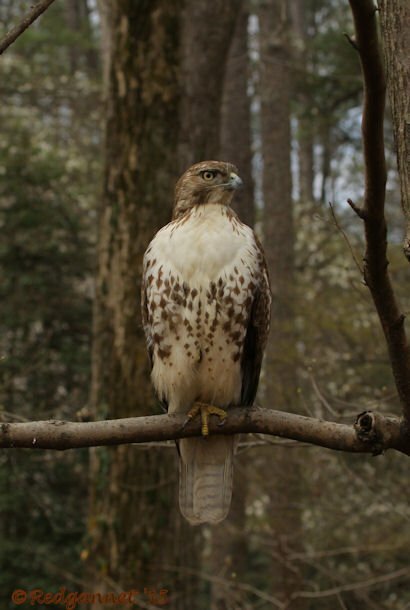 It was fascinated by something on the ground and suddenly dropped from its perch about 10 feet above the ground and plunged into the leaf litter. 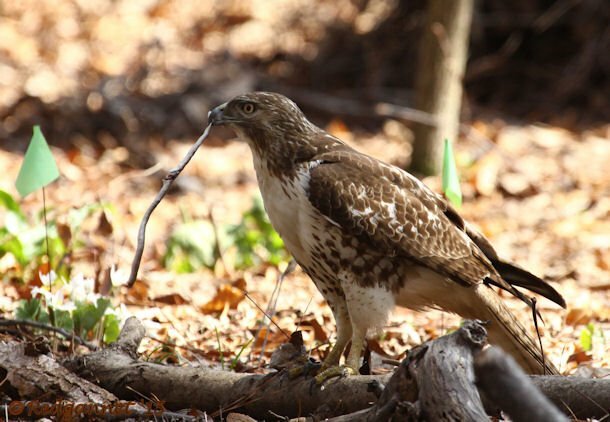 It was clear that it had nearly caught something, but the prey was not giving up without a fight. 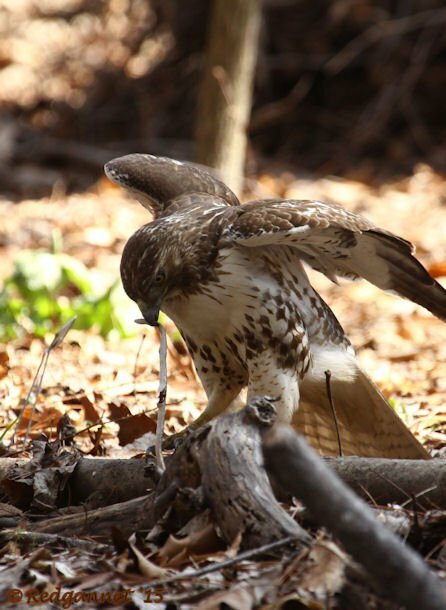 A log that marked the edge of the trail was obscuring much of the action, but once the redtail got a good grip it became clear that it had captured a snake. 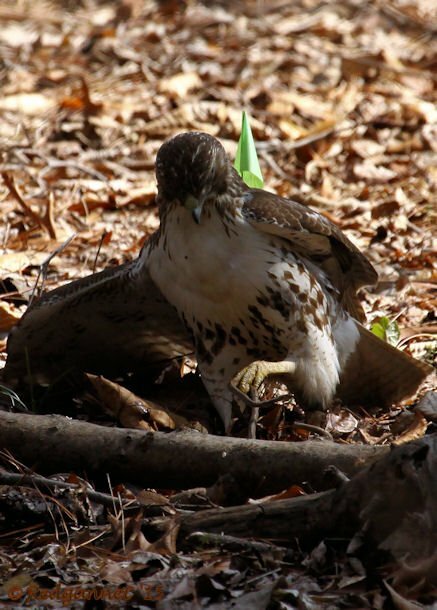 The reptile was battered with repeated lunges and stretched between talon and beak, but continued to wriggle until the young hawk managed to get a good grip on the head and after that there was only likely to be one outcome. The bird waved the snake around as if to satisfy itself that it was dead and then began to bolt it down (I would have given either of my remaining teeth to see it shlurp up the snake like a strand of spaghetti, but actually it thrust its head and neck forward for each gulp and swallowed a few inches at a time). The smoking picture was the last shot before the whole thing was finished. The illusion of a filter and ash at either end of the cigarette are caused by injuries and snake juice. Woodlands Garden does not have its own eBird hotspot yet, but I feel that is an oversight that should soon be remedied. It is, after all easily accessible from dawn ’til dusk, with its own parking. Oh boy, you’re showing us your age, Redgannet! Here at my office, we frequently have interns who are in their 20s and have no idea what a Deep Purple is – and you’re talking James Dean to the Internet generation? 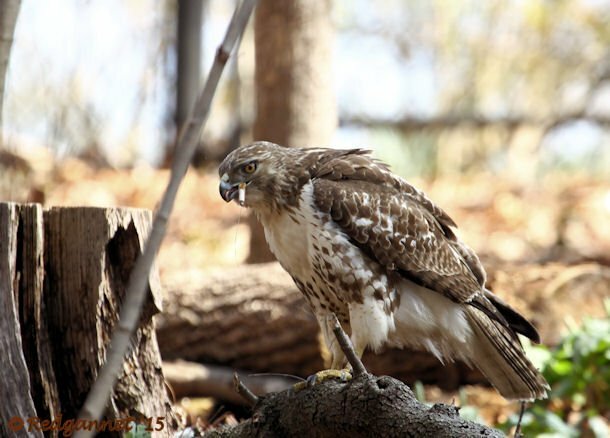 Where Are You Birding This Second Weekend of April 2015?